Clive Herron’s post regarding Mansfield High School had me wondering about the school badge detail. I remember the school wore a green blazer and the seniors wore grey longs and black shoes. I also recall their main rugby field was very hard, having experienced it personally. 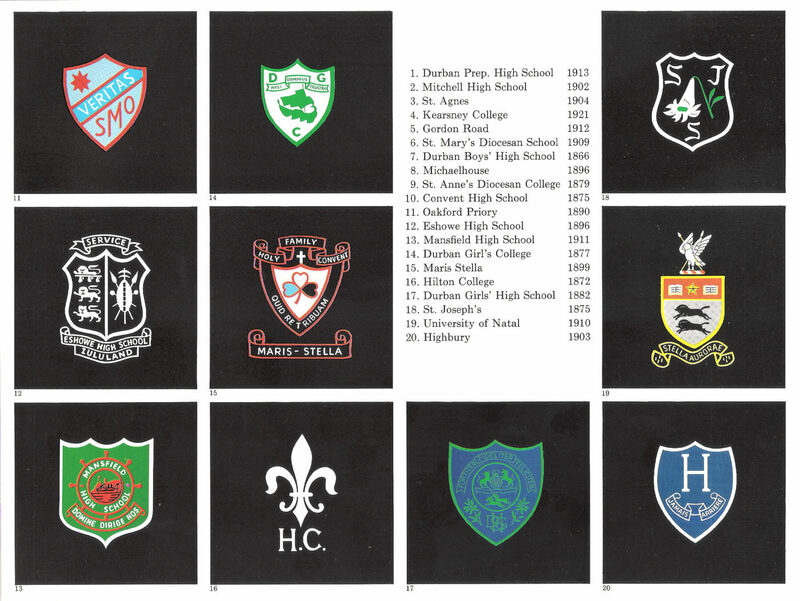 Regarding the badge, I looked amongst my meagre resources and came across this which shows the 20 oldest Natal schools. 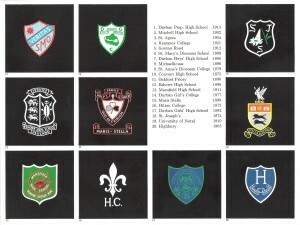 Of those I know of 5 which no longer exist, St Agnes, St Joseph’s, Mitchell Girls High, Oakford Priory, and Mansfield. Interesting to see which are the oldest schools. These pictures come from a 1969 brochure marking Payne Brothers Centenary. Click on badges and picture will enlarge. 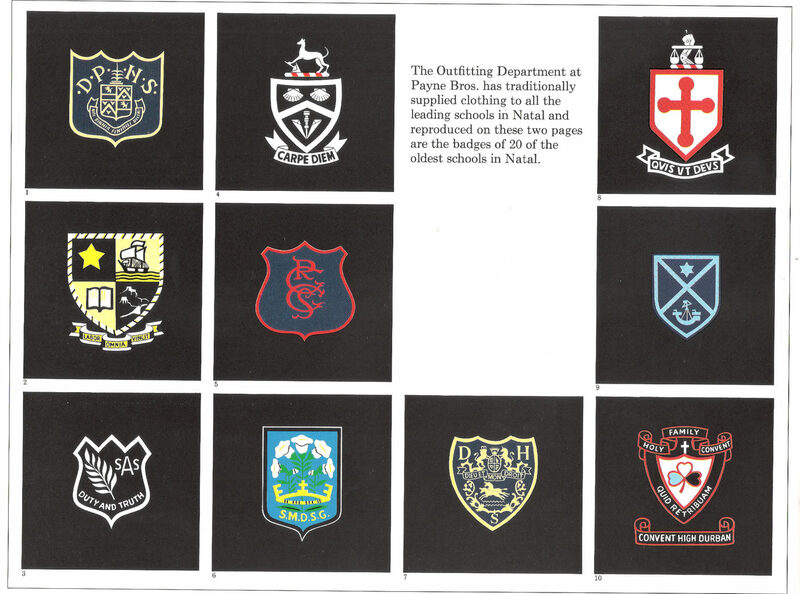 Payne Brothers for some reason omitted the oldest school in the province – Maritzburg College – which just this last week celebrated its 150th anniversary. It could be argued that Payne Brothers only listed schools in the Durban region, but then they do show Hilton College (H.C.) which is even further afield than Maritzburg College. Hi Rodney. I haven’t worked out how to let contributors edit their posts but I will look at that because I’m sure it would be a useful feature. In the meantime, Ihave corrected the error. No sooner said than done. The plugin is now installed and running. Thanks for the suggestion. 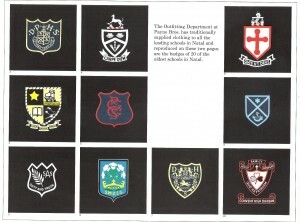 At a guess probably Maritzburg College uniforms were not stocked by Payne’s. Hilton College being a boarding school only ( I think?) there were plenty of Durban boys who attended it. The doyen in the School Uniform Dept. was Mr. Sid Rainsbury who joined Paynes in 1909. He ended up with over 60 years service at Paynes. My only recollection of the Paynes school department is going there once to buy a pair of black rugby shorts. The man behind the counter ( I wonder if it was Mr Rainsbury? )asked if he could be of assitance. I said what I had come for and he replied that sorry, they were right out of stock, try again next week. I looked past him at a shelf well stocked with black elasticised garments and said ‘What are those then?’. He replied very tactfully ‘Those, sir, are girls bloomers’. I departed hurriedly with a very red face. As an afterthought, I am not sure why I went to Paynes on the above occasion. Our family usually did our school uniform shopping at the smaller shop called, I think, ‘Outfitters’ just about opposite Paynes. Perhaps Outfitters were also out of stock of rugby shorts. I suppose that this firm went out of existence years back. ‘Outfitters’. All I could find was reference to fires in other outfitters, but there is no mention of the great Ward and Salmons fire. Ward and Salmons were a firm of outfitters on the corner of West and Field Streets. I think that the building they were in was an old double storey building. It was some time in the 1950s that they had a Red Hot Sale and during this sale the premises burnt to the ground one night. If anyone has a picture of the Natal Technical College school badge please can you send it to Allan via the Contact Us facility. I am busy with a topic I want to post but would like to have a picture of the school badge included. I am talking of the Natal Technical College that was then based at the old buildings down West Street not the new one that was near the Durban Drive In.